Saint Mary’s College of California inaugurated Dr. James A. Donahue as its 29th president in a ceremony held October 11, 2013. 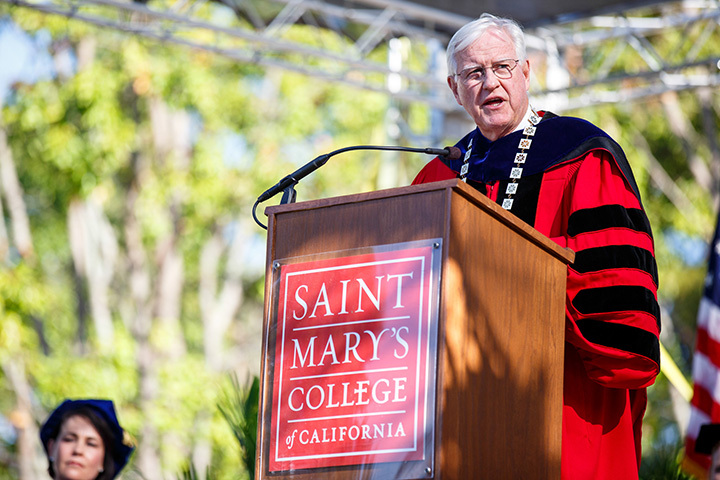 Donahue is the first non Christian Brother to serve as president in Saint Mary’s 150-year history. An accomplished academic and administrative leader, he brings more than 20 years of executive leadership experience at leading U.S. institutions to his new role. Prior to joining Saint Mary’s, Donahue served for nearly 13 years as president of the Graduate Theological Union in Berkeley, CA. Approximately 600 people attended the installation ceremony which capped off a series of events to mark Donahue’s inauguration, including an inaugural Mass; an academic symposium on Catholic higher education, featuring several Catholic college presidents; performances by the Saint Mary’s jazz ensemble; and a free barbecue for the local community.